and harmony to a sumptuous sonic soundscape. Ask yourself - what does a great puzzle sound like? You make the music: Remix cascading loops of analogue synth and thumping bass. Play it your way: Take your time or attempt bonus challenges - the choice is yours. A library of music: 72 puzzling levels means 72 unique electronic grooves. Extend the mix: Extra level packs filled with fresh beats and new puzzles coming soon. Perfect sync: Synchronise progress across all of your machines using Steam Cloud saves. DIY: Create your own tracks in our puzzle editor! coming soon, you'll be able to share your creations with the world! 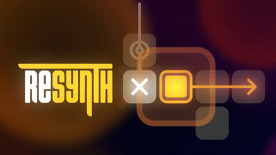 Polyphonic LP creates games that explore the boundaries between music and digital gameplay.